I missed a lot of memes this week, I was pre-occupied worrying about my ill-mother. Thanks a lot for those who said a prayer for Mama, she went out from the hospital today but unfortunately got stranded in town because of the typhoon Peping. Let's all pray that Peping won't leave such devastation that typhoon Undoy caused. I want to participate on this week's Mommy Moment with the "Music in Me" theme. Both my husband and I are music lovers. I love to sing (although the song don't love me back nyahahah) and John can play bass guitar. 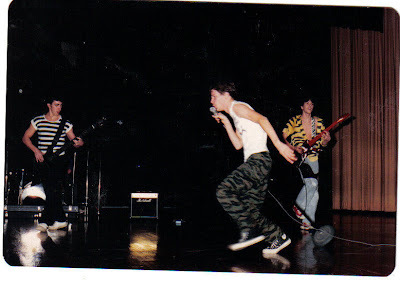 He used to play with their band called Graffiti. See how skinny he was back then? Those were the days hehehe. I can strum guitar too (not very good at it but I can play simple tunes). 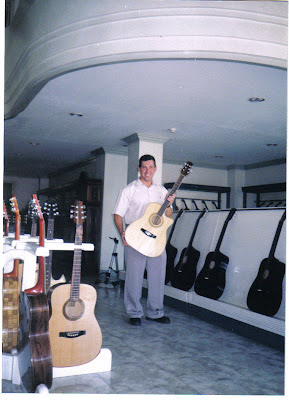 MY husband bought this guitar for me when we had our honeymoon in Cebu. I wasn't t able to brought it when I came to the States and planned to bring when we went there for a vacation but to my dismay, the guitar was broken already. Mama said that our neighbor borrowed it but did not take care of it. I was so mad. This is the piano at my FIL's basement. He told Rylie that if she's old enough to play it that she can have it. We used to play it together when I was pregnant with EJ. During my late brother's wake, there is a video cinco outside our home and hubby encouraged me to sing lol. Don't be disappointed guys, and watch out you might fall on your seat hahaha. I was trying to upload the video of my kids while they were dancing but it is too long that blogger cannot execute it. hahaha Ang bebe pa ng face ng asawa mo bakla sa picture nya sa itaas, at ang cute ng baby mo sa piano. Kumusta na nga pala ang mama mo bakla hope she will feel better soon. mama ko rin nga may sakit, kakapadala ko pa lng ng mola pambili ng gamot. Haaay mga probs talaga sa buhay nakaka stress ano hehehe. Praying for your mom bakla. you take care of your health too, don't worry to much God is there watching our family and he always have the way to make things better. Talented family pala kayo.. Nice !!! hmmm.. pa humble effect ka pa.. I know you're good at music. I hope ok na ang mom mo, at sana nga eh hindi masyado ang hagupit ni pepeng,dahil hindi ko na alam kung ano ang gagawin pag nagkataon. and sis,Thank you so much for your help ha. I appreciate it more than anything. Hala sis, apir na apir tayo. My mother also got sick this week. She also checked out of the hospital today. There's something about old pianos that appeals to me. Oh well, I'm a sucker for old things. 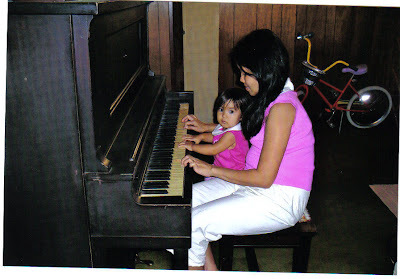 Mom and daughter on the piano - I love that! The video cinco bit - wow! I couldn't do that ehehe... I used to sing a bit, but now matanda na si Tarzan hahahahah! Have a great weekend, sis. that was cool! thanks for visiting my post mommy! Wohoo! the family of singers, hahaha! I sing at home, but outside, I don't. I know that there are some that's worse than me, but..ehehehe, my voice is only for my kids, and my hubby/ Wow, Rylie already got a piano waiting for her, cool! None of my in laws got nothing to leave to my kids, ehehe..so I guess, we have to buy them some. It's Wrozlie who's really interested. Alexandra's voice is so low, that I don't know if whe would be able to carry a tune someday. glad to know your mom's ok. just learned that pepeng wasn't as bad as they expected it to be. so palagay ko oks naman sila doon. heniweys, aba may potential ha! keep it up mommy! love the picture when you and your girl playing the piano and you are juntis! heheh! hahhaa...rock in roll si jowa mo sis bakla....hehehe....feel great to bring the memories back! woi, bongga...hhahaha..para kang natural na singer manang ko...may hidden talent ka pala...kakaloka....hehhehe....ako talaga..nababasag yung mga pinggan eh....lol! gosh noong magsabog yata ng talent tulog yata ako kasi wala akong talent!!!! thanks for joining and sharing your stories with us this week! Oo nga Mommy Rose pa humble ka ha,you have a beautiful voice pala & music lover pala kayo talaga.I love watching your video ang lamig ng boses mo.